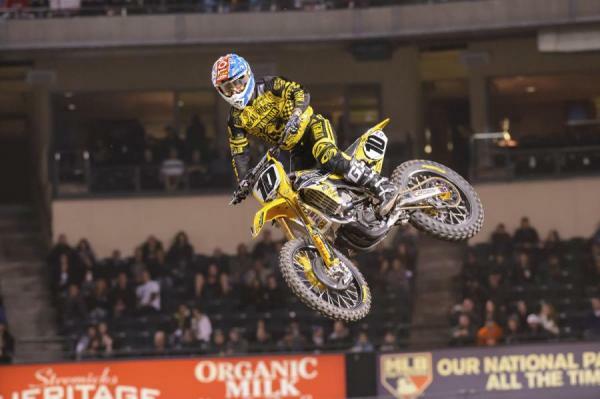 Were you a little surprised that it was him [Chad Reed] coming up there? 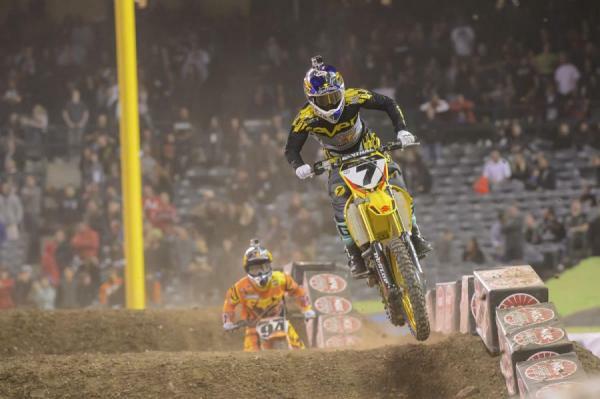 You had Ken [Roczen] on you and Ryan [Villopoto] right there too, and then Chad came up. It must have been a little bit of a surprise. It was. I knew whoever was riding behind was riding really good. And Chad does good—I mean, he’s not a bad rider! He’s fast. When he smells victory like that I think he goes for it. When he’s on, he’s on. And tonight obviously he was. We just took off and we ended up second place. But it was crazy. I saw both Ryans go down, a lot of mistakes out there. So 17th [finish at round one] is hurting right now. So keep chipping away. We closed it down. Just keep on building off that. You’re disappointed because of the way it turned out but you have to be feeling pretty good for being right there. You were close, and leading for a long way. It’s definitely a little disappointing, but I know if I felt like I did at A1 I would feel like I could win this thing. But we’re not there right now. I didn’t get it tonight, but we’ll be back at Oakland. Just take me through you and Villopoto battling. Do you remember what exactly happened there? I know you were close and then he went down. I had a decent start and was having a good battle up front. I think it was pretty exciting racing. I’m not too happy about my riding, I think it could have been a little bit better, but to be in the mix and on the podium again is big. I don’t think I can complain. Talk about the pass on Ryan Villopoto. It was good. I just have to do the best for myself and the team. There wasn’t any dirty riding and I’m really happy with all of it. It was tricky. It was very hard-packed and got very rough. Definitely a different style of track with retro night, you could tell just from the layout. It made for exciting racing tonight. I’m glad that they changed it, because lately it seems that the tracks have all been the same as far as the layout. To have more 90-degree turns and cutting over on the start straight was cool. That was a crazy race with lots of guys crashing. When you saw guys crashing did you dial it back a notch thinking there might be more crashes to come? I tried to push the whole time. You just have to keep your focus because you can easily mess up and wash the front. It was a tough track and it was quite sketchy. But so was Phoenix. You can see that the dirt just dried out much quicker today and the rocks were coming out. It was very hard-packed. Was it hard to make passes out there? I thought it would be harder since it was such a different track, but it was actually okay. It’s always hard to make a pass. You’re the new points leader. Were you aware of that? Really bad luck with the Tuff Blokc—but your starts are putting you in a bad position. I should have never been in the position to get into that hay bale situation—if you can’t start up there you can’t race up there. As competitive as it is right now, there’s just no way to make up any kind of time. You have to start up front. It was cool—got another good start and just kind of rode behind [Cole] Seely for about eight laps. [Jason] Anderson got around me, and I got kind of nervous. I just wanted to finish on the podium. Kind of had a rough day, wasn’t feeling too good this morning. My first practice I rode like an idiot, my second practice, I was fourth, but I got a little sketchy and they said I came back on the track a little too fast, and they docked my fastest lap. So that pushed me back to seventh. It would have been my first time on the board. I guess it all worked out. I feel like you look better each and every week. It was a slow day for me getting going, it’s kind of like I needed to hit rock bottom to get going—and that was the heat race for me. Last lap of that heat race I was like “I have to get something going.” So on the last lap I wheelied into the whoops, and that was better, and it was like all of a sudden I started riding the whole track better. The semi I came from the back pretty good [and finished second]. Then in the main—it’s tough to get a start when you line up out there—so I didn’t get a great start. The first four or five laps, it’s tough back there, and that’s not one of my strong points anyway. I strung some good laps together, nothing out of the ballpark, but good considering where I was. I feel like if I could just start my day better I’d be where I want to be. But you won a heat last week! Yeah but we all know what that is. Yeah it is good! 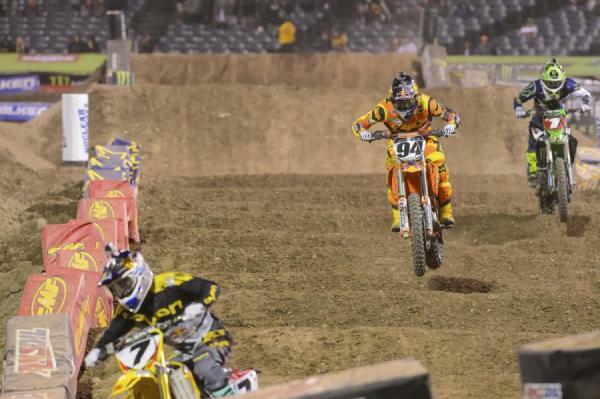 But, you get a holeshot, it’s only six laps. 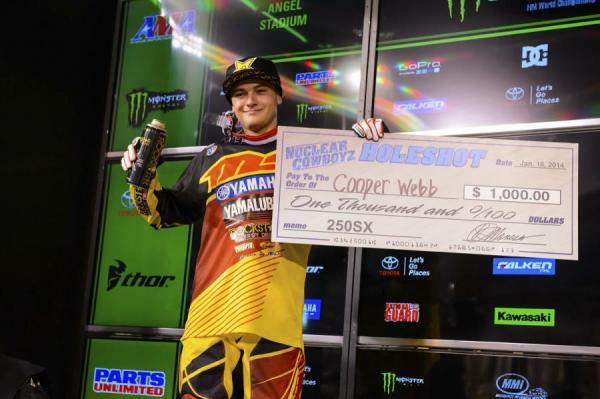 But if you get a holeshot in the main, you could maybe get a podium. The main was rough! I’ve been super sick all day and I’m so happy to get a thirteenth this weekend. It was a rough day, and to transfer right out of the heat race was awesome. I was so worried about that LCQ with a bad start. You transferred with a spot to spare, too.